In case anyone is looking for a target scoring app for their cell phone/tablet. I've been using TargetScan ISSF Pistol & Rifle (http://www.targetshootingapp.com/) for a few weeks and find it pretty good. 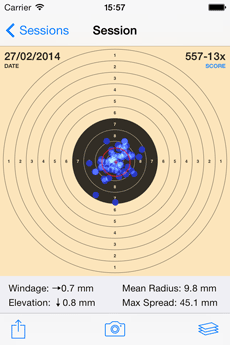 I have only tested with 10M air pistol targets. To me, it was a $8 well spent. I found the app scores best with wadcutters. BUT my Pardini despises wadcutters. What "sold" me on this one is that you only point and shoot the camera (pun intended), as oppose to having to plot every single shot. On a side note, you know your getting old when one starts two threads on the same subject, on the same forum... and don't remember it! Really? Mine is particularly fond of them. Always amazed at different experiences from one gun to the next, even when same make and model. Curious if this would work with 10m air pistol targets that have been scaled to 5m or 6m? Rick; I'm puzzled. Most of the tens of thousands of pellets I put through that Pardini K10 were wadcutters, and it grouped amazingly well with any of them, even the cheapest RWS Diabolo Basic. RWS Hobby were harder to feed but still grouped well - under 3mm centre to centre from a vise at 10 metres for groups of 20 or more. What's changed? Ah yes, but it seems the CCT 5m air pistol isn't in the android app (yet anyway). However, there is NSRA 6yd air pistol (air8) which should serve my home practice purposes well enough. I'll see about giving it a try on Monday. You right Gerard. I was having a brain fart and the "Hangries" at the time. Maybe I should download the app on my new 8" Galaxy tablet. Be much easier to see then smaller screen of the iPhone 6.